South Wales is filled with romantic ruins and castles, a legacy of Norman rule in the 12th century. The largest stone built castle in Wales. Its construction began in 13th-c and was completed in the 14th-c by Gilbert de Clare. 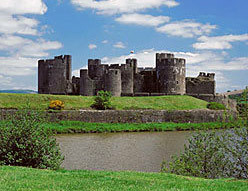 This famous fortress, which has stared as a backdrop in many films and TV series (including Merlin), is surrounded by impressive land and water defences. A unique feature is its leaning tower, which partially collapsed due to subsidence. These formidable Norman fortifications, were redeveloped in the 14th-c as a family home by a wealthy Victorian. 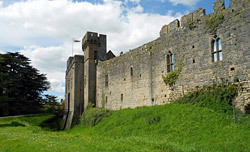 Its tall medieval walls and towers are set in tranquil gardens and lovely wooded country parkland. The romantic ruins of Carreg Cennen Castle are one of the most dramatically sited in Wales. Located at the western end of the Brecon Beacons National Park, high on a rocky outcrop in the Usk valley. This magnificent Norman castle has links with Henry Tudor and was the scene of a great tournament in 1507. Near the castle is a fine Celtic Cross and a working Tidal Mill. Castell Coch (or red castle), is a 13th-c fairy-tale castle of red sandstone with conical towers. The present reconstruction was built as a late-19th-c folly designed by the Victorian architect Burges, for the Marquess of Bute. Internally it is decorated in a highly ornate fantasy style. Set above a gorge of the River Teif. Dating from the 11th-c, the structure has decayed gradually since the time of the Civil War. However, its great round towers and high walls still provide a vivid impression of its former strength. A 12th-c Norman fortress, with a hall, chapel and the remains of a square keep. Romantic ruins of a 13th-c native Welsh fortress, situated in a very picturesque position overlooking the Tywi Valley. Dryslwyn is steeped in medieval history and well worth visiting. Ancient 13th-c palace ruins, once belonging to the Bishops of St David's. Medieval Castle situated on a low ridge, overlooking the Taff Estuary. Now more of a Elizabethan mansion than a fortress, it is set within an elaborate Victorian garden. The site was inspiration for some of Dylan Thomas' later works. The ruins of a 12th-c fortress, built on the site of a much older Iron Age promontory fort. 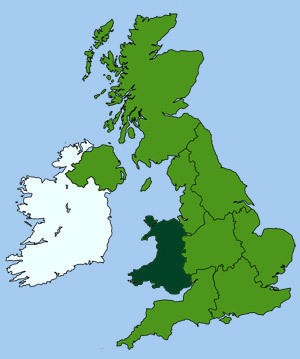 Located on the west side of the Towy estuary, it was held by the de Camvilles for much of the Middle Ages. 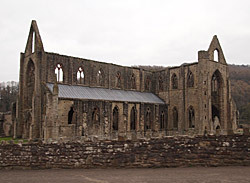 Ruins of an abbey built by Hugh de Lacey on the site of a hermitage dedicated to St David. Built in the 12th-c to protect the possessions of the Bishops of St David's. The ruins of the bishops' hall, kitchen, bake house and other buildings can still be seen, all surrounded by a deep moat. Ruins of a Cistercian abbey founded in 1130 by Richard de Grainville. Small ruined Norman stronghold dating back to the 12th-c. Remains include a small rectangular tower and ornate Norman gateway set about by massive curtain walls. Situated on the banks of the Ogmore. A 12th-c keep and dry moat surrounds the castles inner ward. Ruined manor house rebuilt during the 16th-c. Its most notable features are an Italianate gatehouse and an unusual three-storey porch. Impressive ruins of a 15th-c castle, famed for its 'Yellow Tower of Gwent'. Built by Sir William Thomas and mostly destroyed during the Civil War. Romantic abbey ruins located on the southern edge of Tintern, between the A466 and the River Wye, just south from Monmouth. These spectacular monastic ruins were made famous by both Wordsworth and Turner. Built in 1131, the abbey was home to Cistercian Monks, one of the strictest and most successful orders in the 12th & 13th-c.
One of three Norman castles located in an 8 mile radius of each other. Built during the 12th and 13th centuries, to control the unstable Welsh borders. White Castle is the most dramatic of the three, set in rolling green countryside. This impressive moated castle, built not long after the Norman invasion and later strengthened by Edward I. So named, as its walls were once plastered white. Among the many prisoners incarcerated within its walls was Rudolf Hess, held here after he landed in Scotland during WWII. Skenfrith Castle has a fine circular keep built from sturdy red sandstone. Grosmont Castle is the most rundown of the three castles and contains the ruins of a 13th-c great hall.